I am not kidding when I say that I have grown up on Mahabharat and Ramayan. Indian Televison's best made tele shows Ramayan and Mahabharat aired on Indian Television when I was a little girl. My mom is a huge fan of Indian mythology and my bedtime stories were all about the Indian Gods, Demi Gods and mythological characters. That is how my love story with Indian Mythology and Culture actually started. One story that really fascinated me as a child was the story of Abhimanyu (son of Arjuna) learning the incomplete science of Chakravyuha (war strategy) while still in his mother' s womb(Garbha). So the concept of Garbh Sanskar was etched in my mind since I was little girl. Garbh Sankar is based on the underlying principle that the baby experiences everything that the mom does. And that is why every culture in the world insists that the expecting mom be happy and in good spirit throughout her pregnancy. So when I found out I was pregnant, it was a no-brainer that I wanted to imbibe Sanskar while my baby was still in my womb/garbha. I consider myself very fortunate that I live in India, where Garbh Sanskar programs are conducted very frequently and with utmost proficiency. Without much research I picked up The Abhimanyu Garbh Sanskar course which was being conducted at a centre close to my home. The two day course focused on imbibing the 16 Sanskar or Sola Sanskar that Hindu culture believes and abides by, on my baby through me. The course not only taught us simple physical and mental exercises to practice during our pregnancy, but also, how we could introduce simple daily changes in our thought process and lifestyle to have a positive influence on our unborn baby. It was a life changing experience for me and I was really satisfied with the 2 day workshop. However, not everyone has access to such workshops and hence I wanted to pen this post for the sake of those who cannot attend such programs. So this post is basically a gist of things that I took away from the workshop and from my readings of various Garbh Sanskar books; that every pregnant lady can practice easily even while sitting at home. 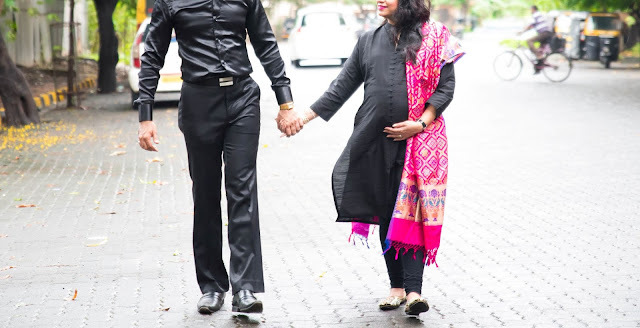 1) Instill Love and Belonging: Garbh Sanskar is all about communicating with your unborn. Every expecting mother should speak to her unborn baby for 5 minutes at least twice a day. Tell the baby about what you did, tell your baby about his father, the extended family. Talk about your dreams and aspirations for the baby and how much you are waiting the baby's arrival. All these talks, instill a sense of love and belonging within the baby and makes him/her feel welcome in to this world. 2) Instill Positivity: On the first day of our Garbh Sanskar class, we were given a task. On our way back home, we were supposed to observe our surroundings and make a list of 10 things that we liked. The next day, we were asked to tell everyone, what we liked. People talked about the sunset, their favorite car on the road, a happy family riding on a bike, etc. What this exercise actually tried to achieve is, it tried to help mothers see the good things around them, which we very easily ignore in our daily life. So if you are at home, and you love your bedsheet, appreciate it. Tell your baby how beautiful the color of the bed sheet is, how soft it feels and what memories it brings back to you. If you see a friend and like what she is wearing, compliment her, tell her how pretty she looks. This exercise will instill positivity in the baby and it will really look forward to coming into this world. It also tells the baby that their mom is a very positive person and he/she has high standards to live upto. 3) Instill Creativity: To instill creativity in her baby, the expecting mother should pursue hobbies she likes. Buy a coloring book and start coloring, pick up some wool and start knitting, listen to music or even better start singing and if your gynac permits even dancing. Play a sport (permitted by your doctor) or if you can't, at least watch one. The Garbh Sanskar Class that I attended had insisted that we color one picture everyday of our pregnancy and watch at least one full cricket/football match during pregnancy, put mehendi/henna on our hands at least once during the pregnancy and if possible draw rangoli in front of our door everyday. Solving puzzles is also a good exercise that keeps you engrossed and creative. 4) Instill Courage and Bravery: Reading stories of courageous people and watching movies about such legends give rise to emotions of bravery and courage within the mother and ultimately within the baby as the expecting mother is high on emotions during her pregnancy. I had borrowed story books from my nephew and read the stories of Shivaji and Jijamata, Jhansi Ki Rani, Ramayan, and watched movies like Bahubali and Moana. Watching senseless masala and violent movies should be avoided, at least during the 9 months of your pregnancy. 5) Instill Strength: Food plays a really big role in making the mother and baby strong. So eating healthy and nutritious food is a must, but what is more important is for the mom to work out/exercise. If your gynac has approved and you are a person who was into fitness even before conceiving, you should continue exercising during the 9 months of pregnancy. It is believed that every time the mom lifts a dumbbell, or does a squat, the baby feels the strength of his mom making him strong too. Every time the mom sprints and her heart is racing, the baby feels the adrenaline rush too. Also, by practicing fitness you are teaching your child in the womb that fitness should be a part of their life early on. 6) Instill Faith: Bringing a baby into this world is a big deal, and I am sure every woman prays that every source of energy in this universe protect her baby and deliver it safely in this world. The power of prayers cannot be measured and so the easiest thing to do during pregnancy is to pray. It will not only protect you and your baby, but will instill faith in your unborn child. Chant prayers, hymns, mantras, meditate daily and read religious and spiritual books, it will not only uplift your mood but will introduce your baby to your path of faith and divinity while in the womb. Here's a list of small things you can do during your pregnancy that will keep you and your baby in happy spirits. 1) Listen to music preferably soothing music, every single day. 2) Listen to holy chants early in the morning and before going to sleep. 3) Talk to the baby every single day, and make the father speak to the baby too on a daily basis. 4) Make sure you groom yourself well during pregnancy. Looking good not only boosts your confidence, but your mood too, which will help your baby stay happy and confident. 5) Add milk, dry fruits and fruits to your daily diet along with veggies. 6) Stay away from television and gadgets as much as you can. 7) Go for evening walks preferably with the father of the baby. Practicing Yoga is a good thing to do during pregnancy, if permitted by your gynac. 8) Visit places of worship during pregnancy. It has a calming effect on the mother and baby. 10) Browze through your wedding album and talk to the baby while doing so. Describe your outfit, the venue, food, introduce your relatives and friends. Basically do everything that brings back pleasant memories to you. 11) Make sure your family throws a Godh Bharai or Baby Shower for you. Or even better, you throw it yourself. Godh Bharai or Indian Baby Shower has great significance in Hindu culture, because it is not only a ceremony hosted to welcome a new soul into this world but also to celebrate the woman/expecting mother who is acting as a medium to bring the divine soul into this world. It is a big deal and hence celebrating it brings a lot of joy and happiness to everyone especially the expecting mother. The unborn baby feels the joy within the womb, and can't believe how lucky he/she is, that so many people have gathered to welcome his/her entry into this world. Keeping an expecting mother happy, should be the responsibility of all the family members. But I believe, one should not depend on others to seek one's own happiness. So, mommies take it upon yourself to find your own happiness. Read a book, take that afternoon nap, go for a spa session, catch up with friends, go on a date with your partner or bestie, eat your favorite food and dress in your most favorite clothes. After all A happy mom = A happy baby. I hope you liked reading this post. If you have anything to add, please comment below. So many wonderful lessons in the readings! Your post is full of insights. Thanks for detailed write-up on Garbha Sanskar. In our tradition we do not throw baby showers or buy anything new for the baby until the baby is born. New things are bought for baby only after 6 days post birth known as chatthi ceremony. I just read the whole article, nicely written by you. I am really thankful to have the information from this blog.